The ISO/IEC 27000 family of standards defines a global standard for information security management. These standards outline the best practices and security controls required for a strong information security program, one that successfully mitigates cybersecurity risk. However, it can be complex, expensive, and time-consuming for security organizations to not only ensure that they have these controls deployed, but also to fully demonstrate that they are working as expected, such as during an audit. In this solution brief, you’ll learn the different ways AlienVault® Unified Security Management® (USM) drastically reduces the time, cost, and effort it takes to prepare for and maintain ISO 27001 certification. With pre-built compliance reporting templates that map directly to common ISO 27001 requirements, as well as pre-built reports for key data sources such as firewalls and key event types such as authentication events, AlienVault USM accelerates efforts to adopt and demonstrate adherence to ISO 27001 requirements. 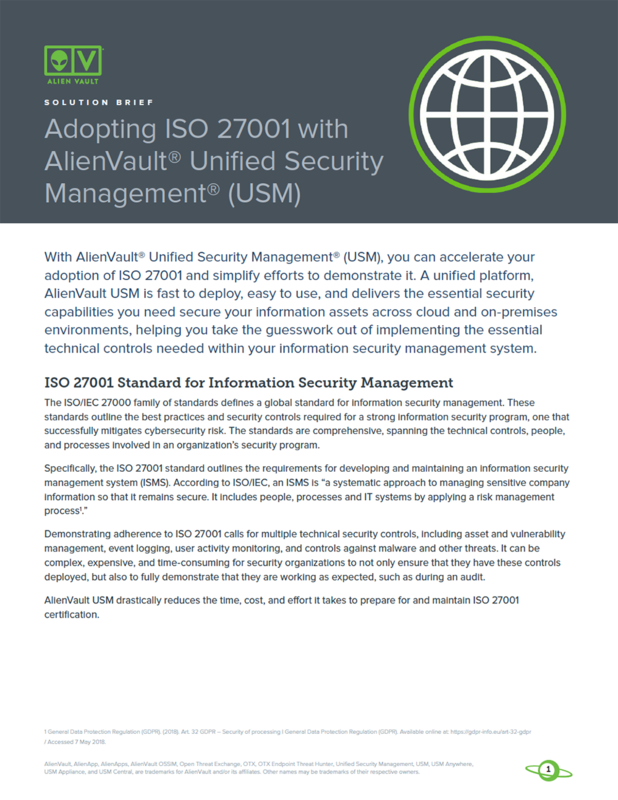 Read the full solution brief now to learn how you can accelerate and simplify your path to ISO 27001 Compliance with AlienVault USM.